The CSO have a new publication, which it is intended to update annually, on productivity in Ireland. It is available here. The analysis assesses the contribution of labour and capital to growth in Ireland and splits the economy into an MNE-dominated sector and a domestic and other sector. A breakdown using the standard NACE classifications is also provided. The first publication covers the period from 2000 to 2016 but the analysis is undertaken for a number of sub-periods, most notably 2000 to 2014, which exclude the dramatic shifts we have seen since 2015. This publication has presented new CSO results for productivity in the Irish economy since 2000. Some key aspects of this publication are set out below. Irish labour productivity growth averaged 4.5 percent in the period to 2016, significantly for the period ending 2014 the equivalent growth rate is 3.4 percent. This compares with an EU average of 1.8 percent for the entire period to 2016. The contribution of the Foreign sector to labour productivity growth averaged 10.9 percent over the period to 2016 and averaged 6.2 percent to 2014. For the Domestic and Other sectors, the result to 2016 was 2.5 percent to 2016 and 2.4 percent to 2014. This clearly illustrates that the impact from the globalisation events of 2015 are concentrated in the Foreign sector as there is little change in the results for the Domestic and Other sector for the two periods. Multi-factor productivity (MFP) has played a small part in explaining Ireland’s economic growth over the entire period 2000-2016. However, when the period 2000 -2014 is examined, i.e. excluding the effects of 2015, the picture for multi-factor productivity in the Irish economy improves and this is clearly illustrated in Figure 5.6 and 5.7. Growth in MFP was higher for the Foreign sector than the Domestic and Other sector up to 2014. However, the negative result for MFP in the Foreign sector in 2015 and in the overall economy over the full period is due to the impact of the globalisation events of 2015 on capital services where no corresponding change in labour input occurred. A major aspect of Ireland’s growth, and therefore its productivity story over the period, is the growth in capital. Ireland’s capital stock per worker has increased from €150,000 to €378,000 per worker between 2000 and 2016, an increase of 152 percent. Capital stock per worker for the Foreign sector increased by an average annual growth rate of 6.9 percent to 2014. When the period is extended to 2016, the growth rate increases substantially to almost 32 percent. For the Domestic and Other sector, the growth in capital stock per worker is around 3.5 percent for both the periods to 2014 and for the entire period to 2016. The EU average annual growth in capital stocks per worker from 2000 to 2016 was 0.6 percent. The rate of increase in capital stocks in Ireland for both the Foreign sector and the Domestic and Other sector was higher than for any country in the EU for which data are available. As this is the first productivity publication by CSO the results are considered experimental. There is considerable scope for extending the analysis presented in this publication to more detailed presentation by economic sector or to more detailed analysis of labour quality, i.e. gender, education, employment etc and their impacts on productivity. We look forward to a full engagement with our stakeholders to assist in setting priorities for future work in this area. IFAC has published a new working paper from Eddie Casey on Ireland’s output gap. It is available here. Multinationals make very real profits from charging for the use of their IP. In 2015, the trading profit made by multinationals in Ireland on their IP shot up by €26bn. This was completely offset by capital allowances they received - basically reducing their taxable profit on that to close to zero. To put it in perspective if we had allowed just 80pc of that to be set against capital allowances, we could have taxed 20pc of it at 12.5pc. It could have yielded around €650m in tax. Figures from the Revenue Commissioners and Tancred (2017) show that there was a €26 billion increase in intangible-asset related gross trading profits in 2015. This was offset by an increase in the amount of capital allowances for intangible assets of a similar scale. These gross trading profits are included in Ireland’s Gross National Income but the use of capital allowances results in a much smaller amount being included in the taxable income base for Ireland’s Corporation Tax. Given Ireland’s contribution to the EU Budget is calculated by reference to Gross National Income, this increase in profits has an impact. Assessing this impact was beyond the scope of the review but is something which the seven-page note linked below attempts to address. With lots of moving parts precision is difficult to achieve but the broad elements of the issue should hopefully stand out. In 2015 intangible-asset-related gross trading profits of multinationals operating in Ireland increased by €26 billion. In the same year claims for capital allowances related to expenditure on intangible assets increased by €26 billion. Using estimates from the Department of Finance implies that these figures have risen to around €35 billion for 2017. These untaxed profits are included in Ireland’s Gross National Income which adds about €200 million to the country’s contribution to the EU budget. A cap on the amount of capital allowances that can be used in a single year is to be introduced for new claims for capital allowances on intangibles. Based on patterns for the past two years the Department of Finance forecast that this will result in €150 million of additional Corporation Tax being paid in 2018. The Revenue Commissioners figures for 2015 and the Department of Finances estimates of the impact of recent onshoring imply that intangible-asset-related gross trading profits are expected to be around €40 billion in 2018 (with a further €36 million added to the EU contribution). If the cap applied to all claims, existing and new, then the additional Corporation Tax to be collected in 2018 could be up to €1 billion using the 2015 figure published by Revenue and estimates from that time used by Finance. If companies who are expected to move IP here in future years are happy to pay the tax now why doesn’t the same apply for companies who already have IP here? The Fiscal Council’s offering in advance of Budget 2018 can be read here. It seemed to slip under the radar but last week the Department of Finance published the first Annual Report on Public Debt Debt in Ireland. It is a really useful publication and the first report reviews public debt developments since 1995 and particularly the huge build-up of debt since 2008. The forward-looking analysis is also very good. The economy is performing strongly and does not require fiscal stimulus. It may be necessary for fiscal policy to “lean against the wind” (i.e be counter-cyclical) to offset overheating pressures and/or prepare for possible downside risks that may materialise. No overheating pressures evident at present but likely if current high growth continues. In the near term, growth may exceed government projections due to momentum from 2016 and possible increase in housing output. Medium-term outlook is uncertain due to external risks such as Brexit, and a “hard” Brexit is used as the central scenario in the latest forecasts. Debt levels remain high and the role of revised debt targets is unclear. Fiscal rules breached in 2016 and likely to be breached again in 2017. Unexpected revenue gains have been used to fund within-year increases in expenditure. In 2016, government revenue (excluding one-offs) grew by 2.7 per cent and primary expenditure by 2.4 per cent; the underlying primary balance was essentially unchanged in 2016 with a similar outcome expected for 2017. Fiscal stance is not appropriate for a rapidly growing economy that is close to its potential, that continues to run a deficit with a high debt levels and that has clearly identifiable risks on the horizon. Fully adhering to the fiscal framework, including to the Expenditure Benchmark after the MTO has been achieved, would go some way towards avoiding fiscal policy that aggravates the boom-bust cycle. The Council welcomes the commitment to develop an alternative to the Commonly-Agreed Methodology for supply-side forecasts. There is much more detail on all of this in the report. The report does not contain much about Budget 2018 because the government have not updated their “fiscal space” estimates. These will be provided in the Summer Economic Statement to be published in a few weeks and will be assessed in the Council’s Pre-Budget Statement. The Fiscal Council are seeking to recruit a Research Assistant. The position is on an initial two-year basis with full details available here. The closing date for applications is Friday 21st April. The start date is negotiable, particularly for candidates completing studies. We now have summaries of the appeals to be made by Ireland (published in December) and Apple (published yesterday) in the state-aid case. Ireland set forward 9 grounds while Apple include 14. The decision also mischaracterizes the activities and responsibilities of the Irish branches of ASI and AOE. These branches carried out routine functions, but all important decisions within ASI and AOE were made in the USA, and the profits deriving from these decisions were not properly attributable to the Irish branches of ASI and AOE. The Commission made fundamental errors by failing to recognise that the applicants’ profit-driving activities, in particular the development and commercialisation of intellectual property (‘Apple IP’), were controlled and managed in the United States. The profits from those activities were attributable to the United States, not Ireland. The readers can identify the difference. The case continues to attract significant attention and there were two recent opinion pieces in The Irish Times from Liza Lovdahl-Gormsen and Paul Sweeney on the topic. Finally, here is a piece worth reading from Martin O’Malloney in the Dublin Review of Books. The report of the Economic Statistics Review Group, and response of the CSO, are available here. There is lots of detail in both that goes beyond the publication of a modified aggregate measure, GNI*. The Fiscal Advisory Council are currently looking to fill an economist role. The position is at AP level and the closing date for applications is Thursday 9th of February. Full details of the post are available here. The latest Assessment Report of the Fiscal Council is available here. The Irish Fiscal Advisory Council are currently looking to fill an economist role within the secretariat. The closing date for applications is Tuesday 11th of October and full details of the post are available here. The Apple Ruling: What do we know? It’s just over a week since Commissioner Vestager announced the state-aid ruling on the tax treatment of Apple in Ireland. We only have the press release and the Commissioner’s statement to go by so it’s still too early to be definitive on what the Commission are actually doing. It could be months before the full ruling is available here but that doesn’t mean we can’t have a stab at what might be going on. There has been a lot of reaction to what the ruling means for Ireland’s Corporation Tax regime. While there has been massive reputational damage (possibly irreparably so) the ruling does not have any implications for Ireland’s Corporation Tax rate or even for any of the rules that Ireland applies to Corporation Tax. Unlike previous instances the Commission is not looking for any change in Ireland’s Corporation Tax regime. In this instance looking for changes would likely have been overreach but that is not what the Commission is seeking. Nor is the Commission seeking to retrospectively impose alternative transfer pricing standards which was a central focus of the recent White Paper from the US Treasury. If the Commission’s case required a change of rules or the application of new standards it would have had little hope of standing up to an appeal. Author Seamus CoffeyPosted on September 9, 2016 September 9, 2016 Categories Competition policy, Political economy34 Comments on The Apple Ruling: What do we know? €13 billion. Wow! Nothing to do with transfer pricing. All do with the relationship between the parent companies and their Irish branches. The EC position is that as the ‘stateless’ companies have no substance ALL of the profit is allocated to the Irish branches. We really are at the races now. The Apple state-aid journey rumbles on. The scene was enlivened somewhat last week with the publication of a white paper by the US Treasury criticising the approach of the European Commission. The paper dishes out a good kicking and provides a useful template for a company or country considering an appeal to an adverse ruling. We know most of the key points the US are making. They are concerned that the US taxpayer could end up footing the bill (as Robert Stack repeats here) but if the tax payments are legitimately due elsewhere then this doesn’t amount to much. But the risks, functions and assets that generated Apple’s profits were in the US so, under the current system, the tax on those customers is due in the US. Of course, a company may decide to move those assets but that is an issue that the country of departure has oversight of. For the period under investigation in the Apple case it is clear that the main drivers of its profitability were controlled and located in the US. The US Treasury paper looks at the substance of the EC position – that some transfer pricing arrangements put in place (for mainly US MNCs) were “wrong”. For the EC is this is a competence they do not have nor one that they should be seeking. If you are intent on saying that something is “wrong” you must be able to state what is “right” – but in transfer pricing there are ranges not precise outcomes. Author Seamus CoffeyPosted on August 29, 2016 August 29, 2016 Categories Uncategorized15 Comments on Are we there yet? Are we there yet? The recent publication by the CSO of the 2015 National Income and Expenditure Accounts generated a lot of reaction. There is no doubt that a 26.3 per cent real GDP growth is bizarre but it was not farcical, false or based on fairy tales. Many commentators went out of their way to highlight that the figures did not characterise what was happening “on the ground” in the Irish economy. But this seems like a bit of a strawman. Instead of being told what the figures were we were been scolded over what they weren’t. No one said the economy was growing at 26 per cent. Arguments against using GDP in an Irish context have made for the past quarter of a century. Even as recently as March, when the first growth estimates for 2015 were provided, there were plenty of people who pointed that the underlying growth rate of the economy was probably around half of the 7.8 per cent growth rate in real GDP shown at that time. Or at least that is what the national accounts tell us. The CSO have published the National Income and Expenditure Accounts for 2015. These show that real GDP expanded by 26.3 per cent in 2015 and real GNP grew by 18.7 per cent. Do these numbers mean anything? It is hard to know. Looking at the expenditure approach the big real changes were in investment (+26.7%), exports (+34.4%) and imports (+21.7%). In nominal terms, exports in 2015 were put at €317.2 billion, up from €219.8 billion in 2014. Exports minus imports was €81.2 billion compared to €34.6 billion in 2014. We would usually expect most of this to feed through to the outflow of factor payments but net factor income from abroad only went from –€29.7 billion in 2014 to –€53.2 billion in 2015. That means most of the improvement in net exports also contributed to GNP but the “gross” part of this seems to be important. The reason is that there seems to be an awful lot happening on the asset side of the national accounts. The nominal provision for depreciation rose from €30.9 billion in 2014 to €61.6 billion in 2015. It looks like a large part of the increase in gross value added in 2015 of €60 billion went to cover the depreciation of assets. The biggest source of the additional value added was in the Industry sector which rose 97.8 per cent in real terms over in the year (and in nominal terms rose €50 billion). The CSO don’t provide a sectoral breakdown for this (they usually do) but it is probably a safe guess that a large part of it is related to the chemical and pharmaceutical sector. One explanation is that a number of sectors saw MNCs move intangible assets onshore. This increases gross value added in Ireland as there are no longer outbound royalty payments. There is also a once-off increase in investment when the asset moves here (but the growth effect of this is offset by the import of the asset). It is also worth noting that the increase in value added isn’t necessarily related to goods manufactured in Ireland. The CSO’s External Trade data, which only include goods that physically leave Ireland, shows €111 billion of goods exports from Ireland in 2015. Goods exports in the national accounts are done on a different basis (where ownership rather than location matters) and show exports of €195 billion. A large part of the value added from these exports is accounted for in Ireland. So we have a large increase in gross value added but this doesn’t fully feed through to increases in wages and/or profits. Non-agricultural wages and salaries rose from €67.7 billion in 2014 to €71.5 billion in 2015. The domestic trading profits of companies rose from €52.3 billion in 2014 to €74.4 billion in 2015. This €22 billion increase roughly corresponds the increased outflow of net factor income. Profits before depreciation would be up by even more but a lot of that went against the fall in the value of the assets. But even then the value on onshored assets can’t account for all of this. Most of the increase in investment can be attributed to research and development which in nominal terms rose from €9.6 billion in 2014 to €21.3 billion in 2015. It is likely that most of this increase is due to once-off purchases of intangible assets rather than ongoing expenditure on R&D. There may also be impacts from the aircraft leasing sector. Although the investment figures show a small decrease in investment in transport equipment in 2015, a balance-sheet effect may have resulted in increased aircraft assets being accounted for in Ireland. Gross value added in aircraft leasing may be high but depreciation of the asset would again consume a lot of this. The CSO highlighted this and slide 6 of their presentation on the figures shows that Ireland’s gross capital stock rose by about €300 billion in 2015, from €750 billion to €1,050 billion. Even with today’s inflated figures this corresponds to an increase in the gross capital stock equivalent to 120 per cent of GDP in just one year. Investment in 2015 was equivalent to just over 20 per cent of GDP so these balance-sheet effects impacted the capital stock to the tune of almost 100 per cent of GDP. Unsurprisingly the European Commission have concluded that Ireland’s “excessive deficit” per the reference values in the TFEU has been corrected. The Commission decision is here. The Commission have also published their country-specific recommendations on Ireland based on this staff report. [Following the abrogation of the excessive deficit procedure, Ireland is in the preventive arm of the Stability and Growth Pact and subject to the transitional debt rule.] In its 2016 stability programme, which is based on a no-policy-change assumption, the government plans gradual improvements of the headline balance until reaching a surplus of 0.4% of GDP in 2018. The revised medium-term budgetary objective  a structural deficit of 0.5% of GDP – is expected to be reached in 2018. However, the annual change in the recalculated11 structural balance of 0.1% of GDP in 2016 does not ensure sufficient progress towards the medium-term budgetary objective. According to the stability programme, the government debt-toGDP ratio is expected to fall to 88.2% in 2016 and to continue declining to 85.5% in 2017. 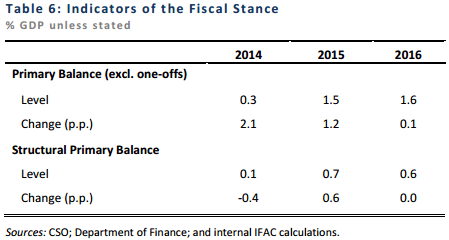 The macroeconomic scenario underpinning these budgetary projections is plausible. However, the measures needed to support the planned deficit targets from 2017 onwards have not been sufficiently specified. 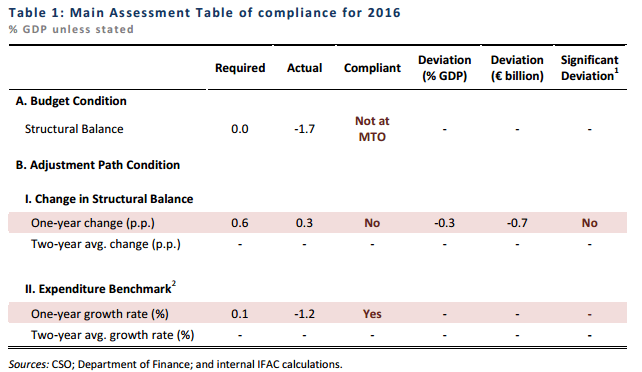 Based on the Commission 2016 spring forecast, there is a risk of some deviation from the recommended fiscal adjustment in 2016, while Ireland is projected to be compliant in 2017 under unchanged policies. Ireland is forecast to comply with the transitional debt rule in 2016 and 2017. Based on its assessment of the stability programme and taking into account the Commission 2016 spring forecast, the Council is of the opinion that Ireland is expected to broadly comply with the provisions of the Stability and Growth Pact. Nevertheless, further measures will be needed to ensure compliance in 2016. The Commission press release detailing all of the decisions taken and documents published today is here. The 2015 Annual Report of the Revenue Commissioners is available here. They also published a useful article by Paul Tancred on Corporation Tax receipts in 2014 and 2015.